Everyone knows that Santa has his dress pants custom made in Wisconsin, but word on the street is that he is looking to procure this year’s bibs from Rigby, Idaho. It’s true. Well, as true as something that is completely fictional can possibly be. 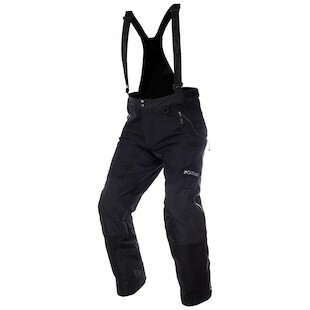 If the great gift giver from the north were looking for a pant upgrade, however, Klim would have the gear for him. New to the game for Fall of 2014 is the Klim Tomahawk Bib, and it is plenty hearty for the most taxing of usage. With a waist-high construction and Gore-Tex Three Layer Performance Shell throughout, this is a 100 percent waterproof option that securely adheres to your body. With a high-back/low-front design, you will be guarded against snow dust kicking up behind without being encumbered by excess material at the front. Another important feature can be seen in the side-zip options that open up for max-flow ventilation when you are working hard. This is extremely helpful in limiting the excess sweat that can occur even in cold temperatures. On top of it all, special attention has been paid to protection and ease of use with the removable knee/shin pads and glove-friendly zipper pulls. Even if your journey doesn’t call for a stop at every house on earth in one night, you still have a lot to plan for when setting up your outdoor excursion. If you are looking for guaranteed waterproofing, comfort, and snow-based functionality, the Klim Tomahawk GTX Bibs are a seriously great option.